Cascadia has timbered villas and chalets aplenty. But what exactly makes a grand lodge? It should breathe an air of epic romance, a place where daily worries succumb to wild beauty and creature comforts. This retreat invokes the mythic best of the Northwest. Timberline Lodge’s multi-story stone hearth—an immense, hexagonal furnace weighing 800,000 pounds—would be at home on the History Channel’s Modern Marvels, along with the rest of this mammoth Mount Hood snow fortress. Dedicated in 1937, Portland’s nearest (dearest) mountain lodge screams old-fashioned Oregon ingenuity. The Depression-era Works Progress Administration funded its local teams of weavers (who hand-loomed the curtains), artists (who lined its glass mosaics), and carpenters (who hewed beams big enough to hoist sails on the HMS Victory). The historic Barlow Rd., the Oregon Trail's final leg, leads to Trillium Lake (left) for photo ops or stroll the 2-mile shoreline trail to enjoy reflections of Mt Hood (right). Cascadian architecture - NATIVE MATERIALS AND OLD WORLD QUALITY create a unique and truly regional style known as Cascadian. Three decorative themes including wildlife, Native American, and pioneer appear throughout the lodge. Visit the Exhibition Center - Once inside the lodge, the once-damp, black hole of the Lodge's lower level is now the airy Exhibition Center. Blue Gentian guest room - Here a visitor can stop the clock as one of the Center's highlights is the life-size replica of the popular Blue Gentian guest room. The viewer looks into this room through an outside window and sees an occupied hotel room in 1937 with period music and the voice of FDR coming from the 1930s radio on the bedside table. Heidi and Bruno - Visit with Heidi and Bruno, Timberline's resident St. Bernards. Take a USFS Ranger Walk or smartphone audio tour - Join a U.S. Forest Service Ranger for a 30 minute tour of historic Timberline Lodge. Explore the rich history and art of the Lodge and all it has to offer. This elegant rustic hotel has become a grand expression of Northwest art. Meet at the U.S. Forest Service desk inside Timberline Lodge. When: Friday-Sunday (?) at 11:00, 1:00, and 2:00. Monday through Wednesday when Forest Service staff are present. Call the ranger station at 503-622-3191 to confirm hours & for more info. Cost: Free. Donations to Friends of Timberline are appreciated to ensure programs such as this can be continued in the future. Ask about their smartphone audio tours for self-guided walks. If you would like to attend the ranger walk, please notify My Chauffeur before your tour. Cascade Dining Room - Spend the day in historic Timberline Lodge, marvel at the 96 ft. stone chimney while you read by the light of it's gigantic fireplace, soaking up the scenic history and enjoying a hearty breakfast buffet or "Taste of Oregon" lunch buffet* or fine-dining dinner in the Cascade Dining Room (reservations required) where you may want to sit at a window table so you can look south across the tops of the Cascade Mountains to Mt. Jefferson and Broken Top...The Cascade is casual by day, romantic by night--fine dining always. Enjoy the award winning wine list. Open for breakfast, lunch and dinner 7 days a week. Please inquire about tour start times to accommodate the breakfast or lunch buffet. If you would like the lunch or breakfast buffet, please notify My Chauffeur before your tour. Blue Ox or Ram's Head Bars - In the Blue Ox Bar next door to the Exhibition Center, the visitor drops back 70 years in time viewing the glass murals of legendary Paul Bunyan and Babe the blue ox while enjoying hand-tossed pizza or deli sandwich and a pint from Mt. Hood Brewing Company. Enjoy family-friendly casual food and drinks with stunning views of Mt. Hood and Mt. Jefferson at the Ram's Head Bar, uniquely located on the mezzanine (Timberline's living room). Relax and enjoy the heart of the lodge--gaze at the magnificence of this unique timber frame structure. Then consider some of the other activities (below) before you head back to Portland or to your lodging room, where you enjoy the sight and touch of the handcrafted furnishings while watching the soft flicker of the fire. Visit the Gallery Gift Shop - Regional artists are featured along with books, fine gifts and collectable souvenirs. Visit the Wy'East Day Lodge - This lodge was opened in 1981 to provide modern skier services. In the summer, it's a great place to stop before or after your visit to Timberline lodge for food services, gift shops and rest rooms. Take the Magic Mile Chairlift Ride all the way 'To the Top'! - Best View of Mt. Hood-No Skis Required. After arriving and checking out Timberline Lodge, you may choose to ride the Magic Mile Chairlift Ride (open Memorial Day through Labor Day) up near Silcox Hut (the views don't get any better than this! (right*) or hiking there if time allows (see below). While inhaling the cool, clear non-smells of mountain air, you'll go to an altitude of 7000 feet. Have a picnic lunch or just take in the scenery by looking right to the coast range, left to the Great American Desert, and straight ahead, beyond Mount Jefferson and the Cascade mountain range. Sturdy boots & heavy jacket suggested in winter and Spring. Skis are not necessary. Allow 30 minutes to ride up and down or 2 hours if you choose to ride up and walk down. $15 pp RT. If you would like to take the Magic Mile Ride, please notify My Chauffeur before your tour. All participant's must sign the Trailhead Release Agreement. 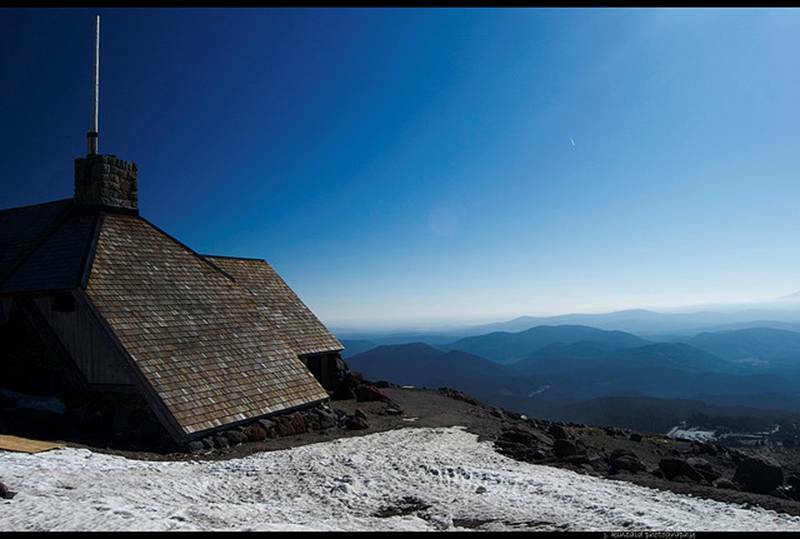 *The Silcox Hut served as the upper terminus for Timberline's original Magic Mile ski lift from 1939 to 1962. Reopened as a chalet in 1992, it now offers overnight bunks for groups and a limited cafe in the European alpine tradition. A ride up the Magic Mile Skyride is a lot of fun, and hiking around on the rocks at the upper end of the chair lift is great, too. It’s worth the ride, just for the views on the way up and the way down. If you take some time hiking at the top, you’ll find even more great places to take pictures, or just sit and relax. Few visitors venture very far into the scenic alpine landscape that lured hotel builders here in the first place. The landscape here is entirely the product of recent volcanism. The silvery snags below the chairlift and along the trail to the Silcox Hut are trees killed by the hot blast of a small eruption in the 1790s. The ground itself on this side of the mountain is a debris field from a much larger, Mt. St. Helens-style blast two thousand years ago. In that eruption, a gigantic avalanche wiped the mountain's slope clean as far as Government Camp. Afterwards, a lava dome slowly rose to plug the vent. The dome remains as Crater Rock, the monolith looming in front of the actual summit. See Below. 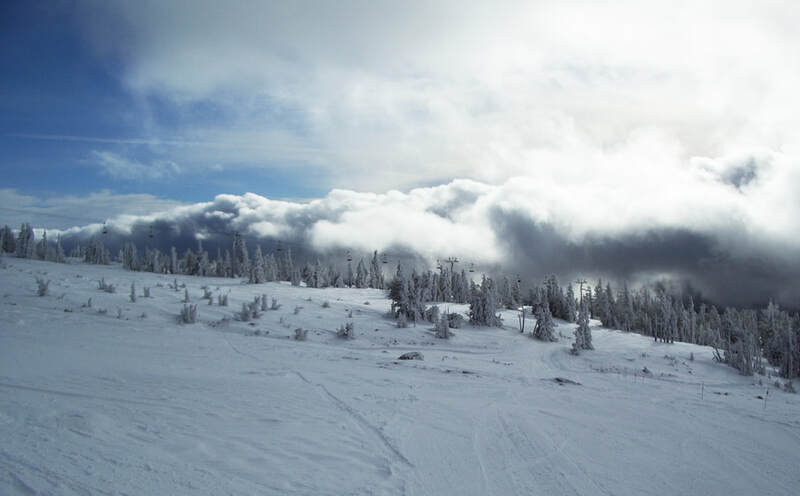 ​Hike the Mountaineer Trail - This is the highest elevation trail on the south side of Mt Hood and most of it is above tree line with outstanding views. Visitors can head west one mile to the old Timberline Cabin site and return on the Pacific Crest Trail for an easy 2 mile loop hike. Or for a more challenging 2.7 mile hike, continue up to the 7000' Silcox Hut and the top of the Magic Mile Ski lift, a 1000' elevation gain. The NW corner of the trail is the least visited and has wonderful alpine terrain. For the trail description and map, ask for the Mountaineer Trail #798 map at the visitor center in the main lobby - Hike to Silcox Hut. If you would like to take a hike, please notify My Chauffeur before your tour. Snow free July through October. Hike It. All hikers must sign the Trailhead Release Agreement. Think Timberline Lodge is cool? Just wait until you see your room. Warm, comfortable and inviting. Steeped in rich Pacific Northwest history. Built by hand to withstand the ages. One of the prestigious Historic Hotels of America. Oh, what those trendy new hotels would give for just a smidgen of the charm and personality you’ll find here. Inside the lodge or the spectacular Silcox Hut. Winemaker's Dinner Series @ Silcox Hut & other culinary events - You'll find one-of-a-kind dining experiences like the exclusive Winemaker's Dinner Series, which pairs a six-course meal with Oregon wines high above the main lodge in the rustic Silcox Hut. Mt. Hood Brewing Co. - On your next mountain adventure, stop in and enjoy the family-friendly, casual ambiance and home of their premier handcrafted ales and hearty fare like Tillamook cheddar burgers and beer-battered fish & chips, in Government Camp. Barlow Trail Roadhouse - From the same era as Tad’s, this Welches roadhouse first opened in 1926 to feed travelers coming around the south side of Mt. Hood. Stop for a breakfast of Avalanche Biscuits and Gravy or the Volcano Scramble.